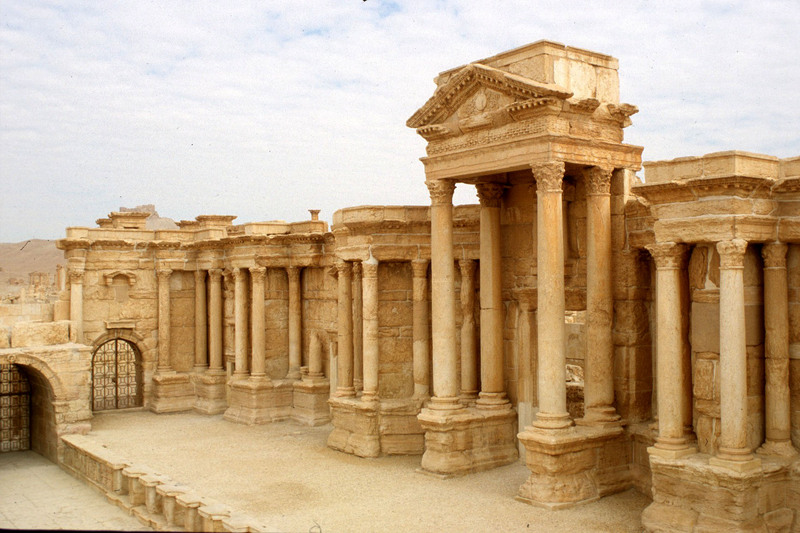 The horror of the current Syrian refugee crisis, coinciding with the destruction of the two thousand year old Temple of Bel at Palmyra, intensified the pain that I have felt ever since Bashar al-Assad ordered police to attack peaceful protesters with live bullets in the spring of 2011. The Temple of Bel, Palmyra (32 CE) and Tower Tomb of Ehlahbel (103 CE) as I saw them in 2006. When I traveled in Syria in the spring of 2006, I found a hospitable people with hopes for the future that appeared plausible. Although people I met there deplored and feared the Assad regime they expressed optimism that the situation would improve. Lacking economic resources, the nation was poor, but, having achieved a high standard of education, it was rich in human capital. Today I feel intense grief for the Syrians, their culture, their ruined cities and their lost architectural heritage. When I made my plan to visit this country, I was drawn, as an architectural historian, to archaeological sites from Ugarit which produced the world’s first alphabet in the fourteenth century BCE to the imposing Roman city of Palmyra, the significant Early Christian churches, the great Umayyad Mosque in Damascus and crusader castles. But, wanting to meet contemporary Syrians, I contacted Bassam Kahaleh who had been my teaching assistant at Washington State University many years earlier. Running a leading architectural practice, he had become the president of the Syrian Order of Architects. He invited me to lecture both at the University of Damascus and at the Professional Society. This opportunity enabled me to engage with faculty and students. When I look at the faces of my audience at the university or the group of students who joined me for conversation afterwards, I agonize over their present situation. How many of them are still alive? Are they scattered through refugee camps, attempting to flee to Europe, or still in Damascus? Although Bassam translated my lecture, many of the students asked questions in excellent English. One of them told me that their passion for contemporary architecture forced them to learn English so that they could study books unavailable in Arabic. I found the faculty progressive, and articulate. Women outnumbered the male students in the school of architecture. Bassam showed me around Damascus, invited me to his office and to his home, where I met his delightful family and enjoyed a wonderful lunch. I am happy to have regained contact with him after a long gap. Traveling through Syria with a small group I saw many inspiring sites. At Hama, I marveled at several ancient water wheels, known as norias, successors to devices that have raised water for irrigation from the Orontes River since the Byzantine era. I visited the nearby studio of an artist Sameer Tenpor, talked with him for a while and bought the watercolor shown here. He used coffee as his pigment. Of course, every time I look at this painting, I wonder what has happened to him. In Hama, protestors suffered the consequences of courageously sticking to their principles. The water wheels survive today, but many citizens died or suffered serious bullet wounds. In Aleppo I had the honor to meet with the architect Adli Qudsi at a significant moment in his career. The next day Aleppo was to celebrate its designation as the Islamic City of Culture for 2006, a tribute to his years of work as leader of conservation efforts in the old City. In 1975, distressed by deterioration of the area surrounding the al-Madina Souq and appalled by a master plan that threatened to drive straight roads through the historic area, he appealed to the government in Damascus to apply for World Heritage status for the city. Thanks to his efforts over many years, this was granted in 1998. When I visited his office, he told me of his strategies for preserving the historic core. It seemed, then, that with funding from the Aga Khan foundation, his well-conceived proposals would be implemented: historic Aleppo appeared to have a future. The next day Adli’s niece who was directing restoration at the citadel took me on a tour of it. In this formidable urban fortress, dating from the 13 century I witnessed large scale reconstruction work. She showed me lavishly ornamented residential spaces and a beautiful hamam, as well as the fortifications. In recent years , he Syrian government has revived military use of the Citadel and used it to bombard rebel held areas of the city. Since no observers have been allowed to enter, the condition of the interior remains unknown. But on July 12 2015, a bomb in a tunnel beneath the fortifications exploded , bringing down a long stretch of the walls. The Al-Madina Souq, Aleppo 2006. Now destroyed. I cannot even imagine the anger and disappointment that Adli Qudsi and his niece must feel. Not only are the physical buildings in ruins, cultural places in which generations of people lived, worked and conducted business are lost forever. I was particularly excited to see the architecturally ambitious Early Christian church of St Simeon Stylitis (c.470), a cross shaped martyrium with four long arms, each one like an individual basilica, meeting at a vast octagonal crossing. Only the walls stand, but the architectural detail survives to animate the ancient structure in an inspiring way. I was relieved to read, today, that although this church was at one time captured by rebels, who might have destroyed it, ithe site was subsequently liberated from them undamaged. However, the 5 century church of Saint Sergius at Raqqa, near the River Euphrates has been completely demolished by !SIL. When I stood within these arcades with their subtle rhythm and exuberant capitals, I felt a deep connection with the people who built it a millennium and a half before. Now it is nothing but dust and rubble. The pomp and splendor of Roman architecture has never appealed to me, but, since Palmyra stood out as an outstanding example of the Roman imperial city, I was eager to see it. Today we do not worship the fire god Bel for whom the destroyed Temple of Bel was built, nor do we revere the Emperor Trajan in whose reign it was erected. But this architecture offered powerful evidence of history. On August 18 2015, in the Roman theater, child soldiers under the command of ISIL, executed Dr. Khaled Al-Asaad who had been the director of antiquities at Palmyra since 1963. His ‘crime’ was refusing to divulge where archaeological treasures were hidden. They beheaded him and hung him upside down from a column. This unspeakable murder and the destruction of Syria’s architectural heritage rank as heinous war crimes. An unforgettably poignant experience on my journey to Syria was a visit to the church and memorial to the Armenian Genocide at Deir-Ez-Zor. Having made a pilgrimage seven years earlier to the tenth century Armenian church of Aght ’Amar on an island near Van in Eastern Turkey and learned what I could about the genocide, this visit in Syria meant a lot to me. I was horrified to discover recently that this symbol created by survivors of the genocide and their descendents had fallen prey to ISIL. As if the Armenian community had not suffered enough already, they dynamited it on December 21 2014. Supported by weapons supplied by Vladimir Putin and others, the Assad Regime may hang on to power even after further death and destruction. But Syria, as millions of Syrians knew it and I experienced it briefly, is lost forever. A large part of the surviving, well-educated middle class has already left the country. Much of the great architecture that attracted thousands of tourists and contributed to a rich national identity has been obliterated. ISIL which emerged in a Middle East destabilized by the disastrous Iraq war, resists efforts to defeat it. I grieve for Syria, for her people, her culture her architecture. www.henrymatthews.com Destruction of Cultural heritage. Henry Matthews appalled by the refugee crisis and recalling the generosity and optimism he experienced in Syria before the Civil War, agonizes over the fate of people he met there. He grieves for the loss of life and the destruction of cultural heritage in Damascus, Aleppo, Hama, Palmyra, Raqqa, and Deir Ez-Zor.